Anyone who spends any time on social media can’t have missed what seems like an unusual deluge of images showing people (often children or dogs) with giant-blistered limbs caused by some sort of burn. The casualty’s disfigured limbs are shown beside a picture of hogweed with a warning message to steer clear. So what is it we need to be aware of and what can we do if someone in our care becomes a casualty of this ever growing horticultural menace? Giant Hogweed is a foreign imported plant from Georgia in the 19th Century and was originally considered to be ornamental. Until recently it was considered to have been eradicated through the UK but its ugly nature has emerged of late evidenced through a rash of gory pictures on social media sites. The clear watery sap from Giant Hogweed contains toxic components which, if touched, make skin extremely sensitive to sunlight, meaning it can burn and blister the casualty easily. It is particularly potent on hot summer days when UV rays are strongest. 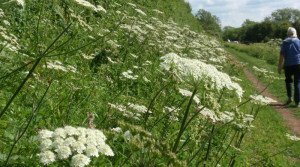 Largely occupying sites such as gardens and allotments but also infected woodland, river-ways, heathland and common land, it looks remarkably similar to Cow Parsley – though it tends to grow much higher potentially up to about 3.5 metres. It also has large leaves and large white flowers on stalks that are flat on top. Note also the leaves are large and deeply cut with sharp coarse teeth. Conversely note how Cow Parsley is much smaller and how different and less intimidating the leaves look. If you recognise that you’re in the area of this plant and there’s any chance that any of you or your party have brushed across it in any way there are two things you should try. Firstly get out of direct sunlight and try washing the exposed area with as much and any available water. Following this keep the exposed limb under wraps and out of UV light until you get a better opportunity to properly wash it. It’s a good idea to irrigate the eyes too – but make sure that you keep your hands out of them while doing so. Monitor the exposed area for up to 48 hours for any damage or blistering. If this occurs proper medical treatment should be sought! And lastly – if you find it growing in your garden? You may want to cover it with a bin liner and dig it up. Dispose of it by burning it. (Weed killer won’t do the job). And be careful to wear full protective clothing covering your hands and face and to take care to wash this clothing and yourself after the job has been done. If you see it growing on common ground – please make the effort to report it to the local council who should come to remove it.